The American Dream is defined by Merriam Webster as “a happy way of living that is thought of by many Americans as something that can be achieved by anyone in the U.S. especially by working hard and becoming successful.” It seems simple enough—move to the U.S., work hard and succeed. But Zobia Chunara understands that for many, the pursuit of the American Dream is a constant struggle, one she’s still working toward today. Her dream is to become a doctor, and with the help of the Weigel Medical School scholarship, she’s getting closer to making that dream come true. Her inclination to want to help others began when Chunara was a young girl. At just 2 years old, she emigrated from Pakistan with her mother and $400. Her mother worked two jobs, day and night, to provide for their family. Five years later, Chunara’s father was able to join them. He worked hard as a gas station attendant, but finances continued to be a worry for the Chunara family; however, they were resilient. Chunara’s mother became a second-grade teacher and Chunara began contributing to their family’s income as a math and science tutor. She never let helping to support her family get in the way of her studies, which led to her attending Yale University to study molecular biophysics and biochemistry with help from the Most Valuable Student scholarship. As her college career began, tragedy struck Chunara's family. During her freshman year, her father had a heart attack and passed away, a year after declining surgery due to his uncertainty in finding a doctor he trusted and a reluctance to burden his family with debt. Although the experience brought heartache to Chunara and her mother, it also opened her eyes to who she wanted to be as a doctor. “Rather, many patients, particularly those who feel powerless, struggle to reconcile personal beliefs and financial capabilities with prescribed treatment,” Chunara explains. 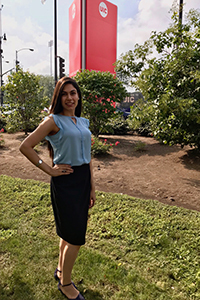 Chunara plans to practice medicine in socioeconomically and culturally diverse urban neighborhoods, primarily those that are medically underserved. She hopes to eventually obtain a medical doctor and Master of Public Health dual degree, which she can use to better understand and address barriers in public health. Chunara will use her knowledge and experiences to create and guide new healthcare policy and innovation that tackles the root of health disparities. Through her life experiences, education, and service, Chunara has realized that her “commitment to serve mankind is a lifelong endeavor.” Chunara spent her time at Yale volunteering, working with Yale-New Haven Hospital heart failure patients, and led teams of dozens of students and physicians. She has proven she’s a leader, an innovator, and completely worthy of being an Elks scholar and recipient of a 2018 Weigel Medical School scholarship.